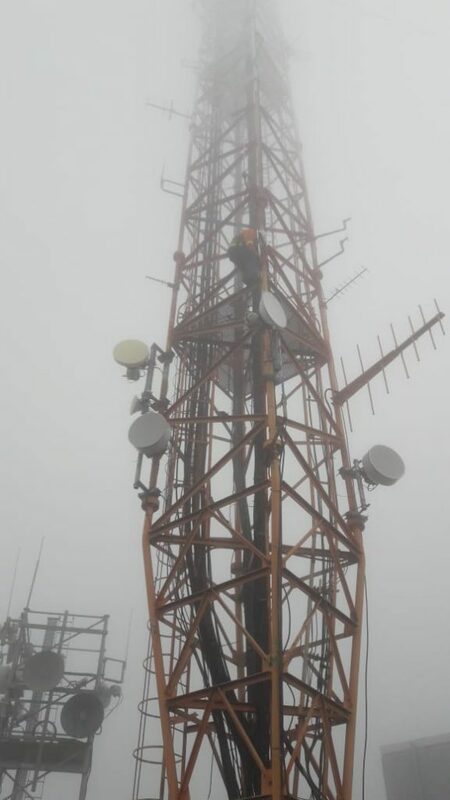 On Thursday 11 October, Mike ZS1TAF and Paul ZS1V took a day off work to take advantage of an opportunity to access the Constantiaberg Sentech site, home of the 145.700MHz repeater. The site was last visited by Sean ZS1BSD and Paul ZS1V during mid-2017. At the time, they diagnosed a problem with the antenna/feedline, but there were no Sentech personnel on site and so, despite being certified to climb, Paul could not attend to the antenna problem. Since then, there have been numerous changes to the management at Sentech and communication has been difficult. Gustav ZS1NZ, who works for Sentech, alerted the WCRWG to an upcoming Sentech maintenance run earlier in the week and so plans were hastily put in place for Mike and Paul to take leave and visit the site. The team met the Sentech technician at the security checkpoint at 9.30am and proceeded up to the site. Despite the warm weather at the bottom, a cloud on the mountain ensured cold and wet conditions at the mast. The SWR at the bottom of the antenna feedline was measured at 2.5:1. The high SWR presumably caused damage to the repeater which was transmitting well below 1W. Despite the unpleasant climbing conditions, Mike headed up the tower to open and inspect the connection point between the feedline and the antenna, but this was found to be well sealed and dry inside. He swapped out the antenna for another and the SWR was measured at the bottom at 1.3:1. Paul swapped out the repeater and removed the bandpass filter for re-tuning. The team left the site just after noon, to enjoy a cold one in a warm and sunny Tokai. For your reading pleasure, the latest report.